The world’s largest solar-powered plant has opened in the desert of Riverside County, California, and could mark the beginning of nationwide large-scale solar plant projects. The 550-megawatt facility is estimated to produce enough energy to provide power for as many as 160,000 homes in the Golden State. It is anticipated to displace close to 300,000 metric tons of carbon dioxide every year, which is the same as removing 60,000 cars from California roadways. The facility, called “Desert Sunlight Solar Farm,” was financed at a cost of $1.5 billion through a U.S. Department of Energy loan-guarantee program, and is expected to make as much as $5 to $6 billion profit for the state of California. Desert Sunlight was build by Arizona-based photovoltaic manufacturer First Solar. First Solar also built the nation’s second-largest solar power plant, the Topaz solar project in San Luis Obispo, Caifornia, which has a capacity of 550 megawatts. Construction of the Desert Sunlight solar plant began in September 2011. The power-on ceremony took place on February 9, 2015. It is the largest solar project on any public lands. 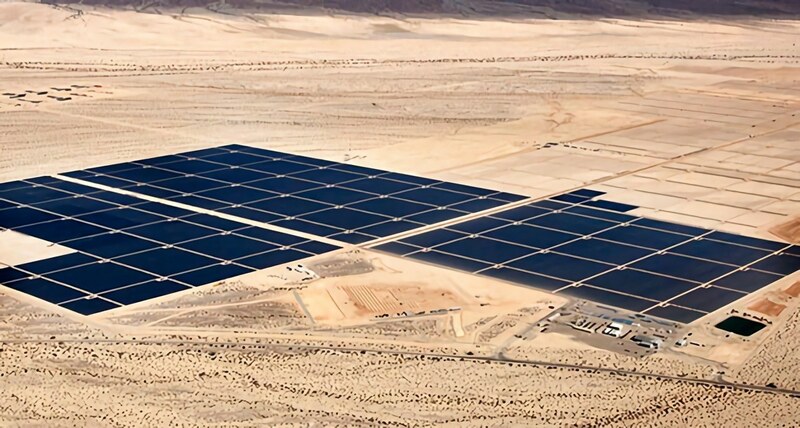 Desert Sunlight is the single largest solar project in the United States. The facility uses PV (photovoltaic) modules that directly convert light into electricity. The massive project uses over 8 million individual solar panels that rest on 3,600 acres of land. The project feeds directly into the California electricity system. Desert Sunlight also boasts a number of community benefits. For instance, over a 26-month time period, Desert Sunlight will create approximately 440 construction jobs. An estimated $15 million in new sales tax revenues and $12 million in new property tax revenues are anticipated for Riverside County. The plant is also projected to bring about $226 million of indirect benefits to local businesses, such as engineering, design, and construction firms, in the region. Desert Sunlight is a landmark step for the U.S. solar industry, and it may propel solar power further toward becoming one of the nation’s top energy sources. The DOE helped launch this large-scale solar industry. USA Today reports that in 2009, there were no traditional solar farms in the country larger than 100 megawatts. Now, there are 17 large solar projects financed by the government. “The debate’s over—we’re going to be moving to more renewable energy,” said Riverside County Supervisor John Benoit. Being trained for entry-level careers in solar installation, maintenance, and repair can pay off greatly in the growing solar power market. Since there is a high demand for competent workers, solar technicians are able to choose between various careers and employers in the industry. Those seeking training programs that include PV science, such as RSI’s electro-mechanical technologies program, have a distinct advantage in the job market, as employers are increasingly 1 looking for workers that have completed technical training. The Solar Foundation reports a rate increase of 53% for solar industry employment from 2010 to 2014—the equivalent of 50,000 new solar-related jobs. Installation businesses are leading this growth with an approximate 60% increase over four years. As of November of 2013, the industry counted 142,698 solar workers, which is almost 20% more than in 2012. Less than 1.9% expect to cut workers, which would amount to a 15.6% overall growth in employment, adding approximately 22,240 new jobs. Becoming a solar technician might be one of the most promising career choices for those who are so inclined. The average job growth from 2012 to 2022 is an expected 24%, much faster than average, as per the U.S. Bureau of Labor Statistics. RSI offers comprehensive training consisting of hands-on practice in realistic work environments and informative classes led by experienced instructors. Qualified candidates may receive financial aid, scholarships, military benefits or student loans. RSI also offers placement and career services for its graduates to help navigate the solar job market.